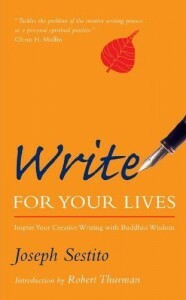 Your Words is Mandala’s section devoted to the writers among us. Send us poetry, creative writing, short essays or letters that are inspired by your Buddhist practice and under 1200 words. Remember from previous chapters that you are writing or revising for a maximum of two hours on any given day. In accord with this, put your time-keeping device in a place where you can view it at all times during your session. Then, make a real effort to keep yourself “in” this two-hour block of time as much as possible, during your session. Only think about what you’re writing about – not the outcome – either of the session or your long-term objective, such as your published book or its level of success in the marketplace, or your article or assignment. Whenever your thinking does go to something else, simply bring it back to the two hour block of time in which you are currently working. As far as your time-keeping device itself, a clock with a second hand and minute hand can be very effective for most writers. For those who are a bit less conventional, something like an egg timer can be very effective. You can set a typical egg timer for a maximum of 60 minutes. But if you are someone who has trouble focusing, you can set it 3 times for 40 minutes each, and take a brief break after the first two times that the timer goes off. Then, you only have to be “in” the process for a relatively short period of time, with each setting. And when the egg timer goes off the third time, your 120 minutes of writing or revising is completed for the day. The effect of these simple strategies can seem almost miraculous in terms of how much they can reduce your stress, and increase your focus and productivity….